The afternoon had started out hot and sunny, and then gone straight to hell. But Team Nineteen was on his heels, and he didn’t have time to burn. Kurenai turned back from contemplating the view, her brows rising. He ignored her. Intel was a problem he could solve later. Genma and Raidou mattered now. “Over there?” Genma suggested, tilting his head toward a massive boulder the road-builders had skirted rather than uproot. A tiny roadside shrine huddled at its base, Jizos or tanuki or who the hell knows. At least it looked out of earshot. And the kids were napping with Kin in one of the carts anyway, while Harubi sat gratefully at the back of the other and pulled off one of her sandals. Kurenai moved back to help her, still with one eye on the ANBU. Ryouma wished he knew the trick of her silencing genjutsu. He’d just have to be quick. Genma’s alert, concerned gaze turned knife-sharp. Raidou folded his arms over his armored chest. Giving Ryouma enough rope to hang himself, in turn…? “Yeah,” Ryouma said, refusing to look away. Not here to defend himself, that was for sure. Or to make his own choices about who to tell, and when. “I’m reporting on myself, Fukuchou,” he said, steadily as he could. It wasn’t very. Genma gave Ryouma one last cold stare, and followed Raidou. He leaned in, murmuring; Raidou’s head cocked toward him. Neither of them looked back, as they headed toward the officers of Team Nineteen coming into view around the switchback. Ryouma released a deep, shaky breath and trudged after them to the carts. He avoided Kurenai’s eyes, but he could feel their thoughtful crimson burn on his shoulders. Genma stuck a senbon between his teeth and clamped down hard, feeling metal grit over molars. Ryouma might as well have just said flat that Hatake was there, too. Carrying out an uncontracted, unsanctioned assassination. In a civilian context it would be called murder. There was no time to confer with Raidou, though, and get their own story straight, because Sumeragi-taichou and her team were already there, in blues and flak vests, with at least a dozen questions. Because Ushiro had all the tact of a rotten egg. And that was a fantastic tactical response. It was easy to forget how subtle Raidou could be when he needed to. He might be a magnificent hitter, but he wouldn’t have missed his calling if he’d ended up in Intel or the diplomatic corps. Ushiro’s heavy brows drew down in a consternated scowl. “We’re moving slowly thanks to the carts and civilians,” Genma explained. “Appreciate it,” Raidou told her. Stag beetles were a long way off from the swarms of kikaichu the Aburame lived in symbiosis with. Tadaichi might love Mayumi’s bugs but Genma wasn’t so sure Harubi would. Two black-haired heads popped up from the side of the cart with the family’s belongings. “Bug ninja!” Tadaichi shrilled, clambering to his feet. His sister was only a fraction slower in jumping down and racing over, with Kin a shaggy blur at her heels. Ushiro, who up until now Genma had thought of as basic brown rice — functional, humorless, and bland — cracked a smile when Mayumi dropped down from the trees and held out a handful of glittering beetles for the kids to inspect. “After, maybe.” Raidou’s lips quirked. That was a big if. “Tousaki, up and at ‘em,” Genma called. Ryouma, who had been skulking just out of hearing range, probably trying to lip-read, lifted his head. He still looked hangdog, but damnit, he should. “I’ll walk,” Kurenai said drily. She didn’t seem particularly happy that she’d been left out of the planning for the first time on this mission. Maybe they should have roped her in for the conference with Nineteen’s officers. There was only one way down the mountain that the carts could navigate: the washboarded trail they were already on. Raidou and Sumeragi came to an agreement that the family cart would lead, with the heavier sake cart at the back. Genma ducked under the yoke at the front of the cart and stood shoulder to tense shoulder with Ryouma, while Raidou went to the back of the cart to serve as both push and brakeman. With the silver-sides of the leaves starting to show in the rising wind, and the holiday mood completely spoiled, at least for Team Six, they set out. Saroma might have been kindly described as a one-goat-village, except it was really too small for that. Six houses clung to the mountainside like stubborn mushrooms, sheltering the precious radio tower between them. There was a goat. It watched Kakashi suspiciously through the window while he used the antique dispatch. The Konoha relay officer was professional, despite the terrible static, and took Kakashi’s confirmation that Team Six were alive and inbound with minimal commentary. In return, she reported one team had been sent to look for them, and as far as she was aware, no one had tried to stage a political coup in their absence. On Kakashi’s way out, the goat tried to eat Pakkun’s vest. “Herbivores,” the little pug muttered, from his hasty retreat to Kakashi’s shoulder. “Mighty hunter,” Kakashi said dryly. The journey back was a quick downhill run, complicated by cracking shale that peeled away in sheets and made the footing treacherous. Kakashi enjoyed the excuse to flex his chakra, shunting it from foot to foot with delicacy or force, depending on whether he needed to stick or leap. Heat had been building like a promise all day. Halfway down, the storm finally broke, dumping water by the bucket. Kakashi’s clothes were immediately plastered to his skin. His hair flattened over his eye. Pakkun said, “Oh, that is it,” and jumped down. Kakashi snapped the summoning link. Pakkun vanished before he hit the ground, joining Yori and Saishou back in their own dimension. Which was probably dry. Kakashi raked his hair off his forehead, rolled his eye, and kept going. There was lightning in the distant thunderheads, tumbling around the horizon. It pulled on his blood, warm and a little tingly, a better thing to focus on than damp socks. He was muddy, chilled, and half scent-blind by the time he made it back, chakra pulled in close for heat and balance. He spotted the heavy sake cart first, with two figures between the traces in front, a third pushing from behind, and dropped down to make his report. Genma looked up with a glare like a thermal torch. Kakashi faltered. It was Ryouma next to Genma, shoulders hunched in the rain, not Raidou. A quick chakra sweep revealed the message was belated. He recognized Hakone’s signature, like cool water. That slightly unnatural tangle was an Aburame underneath the umbrella with Harubi and her children, not Kurenai. Two other signatures were unfamiliar, but they both had ANBU sparks. Ryouma stepped away without a word, vanishing into the curtain of rain. Kakashi stepped in and shouldered the abandoned hauling pole. It put Genma on his right, in Kakashi’s narrow field of vision. The lieutenant’s back was rigid. Kakashi opened his mouth, closed it. Focused on guiding the cart down the flooding pathway. Kakashi was going to kick Ryouma in the head. Apparently Ryouma’s version had been light on details. Kakashi’s thoughts picked up speed. Sen hadn’t been the weak link, or Genma would already know about her. Ryouma… might have confessed from pure guilt, but he’d been fine a few hours ago. Which made Team Nineteen the extra variable. They’d been hunting for Team Six. Genma’s expression, already blank, went colorless. In the rain and churned mud, Kakashi couldn’t get a scent-read on him. The cart lurched over a rutted gulley. Behind them, Raidou swore. “And you didn’t think to run this at-minimum B-rank unauthorized ‘mission’ by either officer?” Genma said, voice flat. Well, that was a little dramatic. And, yes, technically Sen was a child, and a civilian, but she’d seen enough to sharpen her edges. Konoha children learned to kill younger than that. Well, a potential problem. Three potential problems. One: the tanuki had enough raw firepower to raze Konoha to the ground if they felt like it. Himself and his clan were limited to Tsurui Province, but Himself had said they weren’t the only clan. Two: Tanuki healing was better than anything Konoha could do by a landslide. Medics at home would want that. Rin would want that. The chances the tanuki would share that knowledge was… slim, at best. With pissed off, betrayed tanuki, it was probably none. Maybe Kakashi would kick himself in the head. “Why, exactly, did you make a deal with a clan of tricksters?” he asked. Kakashi returned the look, but couldn’t bring himself to say: maybe if you’d told us. The thing was, Kakashi had known something was going on between the officers and Himself. He’d asked Raidou about it, after Himself had made his snarky little sake label: ‘A promise between friends spans worlds and eons.’ Raidou had brushed it off. Kakashi hadn’t followed up. In retrospect, a slight error. Kakashi flexed his jaw. Tension pulled his shoulder blades together like a zipper, his chest was a slurry of ice and glass, and Genma had a point, technically. Sen had said murder, and Kakashi had said okay. He hadn’t explained why she’d be safe in Fire Country, or what Genma, Raidou, and Kurenai had done to discredit the man. He hadn’t said, think about it. He hadn’t said, you’re missing information. He’d seen the simplest solution, which had happened to align exactly with what Ryouma wanted, and he’d done it. He’d gotten emotional. He still was. He was angry. Given the chance, he’d hang Nomiya all over again. As a substitute for Ryouma’s grandfather. Because Kakashi had a blind spot for damaged children. Because Nomiya had goddamn earned it. But Konoha hadn’t asked for it, and Kakashi wasn’t a solo jounin anymore, allowed to make unilateral decisions. Especially if his commanding officers were going to go around making ill-considered bargains without consulting him first, or telling him after. He lapsed into silence. The rain grew heavier, hammering down like punishing needles. Genma’s hair hung in plastered tendrils around his face. Kakashi’s vision was framed in wet silver. Damp wood and repeated strain conspired to rub blisters into unwary skin. The cart bounced and shuddered down the trail, hitching when Raidou and Ryouma worked to brake it, and Kakashi had to wonder if their conversation was worse. Darkness fell long before the rain stopped. The road refused to level. Mud pulled at wheels and shinobi boots and civilian sandals, until Sumeragi Shizuka ordered Harubi back up into the handcart with her children. She offered Kurenai a ride, too — “One more won’t make a difference.” Kurenai was beginning to regret declining when Ushiro Keiichi, Team Nineteen’s lieutenant, swung out of the trees. “Decent camping spot about 400 meters southwest,” he reported. “Hatake made it back, too?” He sounded disappointed. “About time!” Nakamura Mitsuko threw her weight into veering the handcart towards the sodden verge. “Hakone’s got strong fire jutsu, he could start drying it out for us.” It was a more pointed suggestion than Kurenai’d expected from a non-officer, but Nakamura seemed the kind of veteran who was as confident in her experience as in her own skin — all two meters of it. Shibata Hakone looked almost slight beside her. He sighed, looked back for his captain’s nod, and helped Nakamura muscle the handcart out of the last muddy ruts before he ducked into the trees after Ushiro. Chakra flickered behind them in the storm, a weary acknowledgment. They’d separated the carts for safety’s sake on the steep downhill grades, but Kurenai couldn’t help wishing she’d hung back with Team Six. Whatever Ryouma had told them, Genma’s chakra still clenched like a fist, unsettlingly tense. Ryouma’s was even worse. Tents, fire, food. They’d get Harubi and her children settled, and then she’d get answers. As poor going as the roads had been, the forest was worse. Sumeragi left the handcart in the shelter of a massive rhododendron thicket and hefted an exhausted Tadaichi on her hip. Sen allowed herself to accept Nakamura’s offer of a piggyback ride. Aburame Mayumi, almost faceless beneath the giant hood of her waterproof coat, offered her arm to Harubi. There was something to be said for ANBU as rescuers, Kurenai decided, following the women to their new camp. Kin’s solid, sodden shoulders insinuated themselves under her hand. She leaned, gratefully. Ushiro and Hakone had a fire blazing already, smokey beneath a suspended tarpaulin. They’d pitched one tent on a rocky spur uphill. Uncomfortable, but well-drained. Neither of the children protested as the ANBU bundled them inside and their weary mother coaxed them out of their wet clothes. Hakone appeared with tin bowls of a thick, rehydrated seafood stew; Nakamura dug through an unsealed scroll for long-sleeved uniform shirts that swamped all three of them. Kin shook herself vigorously, slipped into the tent, and settled just in time for Tadaichi to fall asleep on her flank. Sen and Harubi looked like they wouldn’t be far behind. Kurenai left Nineteen’s rookie to collect their empty bowls. If he was anything like his father, he’d be the patient type. She was not, at the moment, feeling very patient herself. She ducked beneath the tarpaulin that shielded the fire, and saw Team Six coming through the trees. They’d left their handcart, too. They were lean, drenched, as grim-faced as she’d ever seen them, and they paused just outside the tarpaulin. The rest of them crowded under, careful around the fire. Kakashi’s chakra spun up from its tight shield. Water poured from under his armor and flowed out into the rain. Ryouma reached for his armor buckles. “Probably,” Genma admitted, loosening the buckles at his own side. “But Hatake manages it pretty well.” He didn’t follow Ryouma’s lead in peeling his chestplate off — or the shirt that followed swiftly after it — but he did breathe a little easier as the armor bindings slackened. He shaped a couple of handseals, and his underpinnings began to steam. Nakamura cupped her chin in her hands and sighed happily as Ryouma’s belt loosened. On his other side, Kakashi twisted a new handseal. Rapid clouds of veiling steam boiled up from Ryouma’s discarded chestplate and shirt. Another handseal converted the jutsu back to an efficient yank that pulled water out of clothes, skin, and hair for everyone under the tarpaulin. When Kurenai could see again, Ryouma was rebuckling his belt. Ryouma ducked back into the rain shirtless, without even a rookie’s traditional put-upon sigh. Nakamura, disappointed by the steam, watched until the rain swallowed the last flicker of firelight on tattooed skin. Kakashi’s brow drew down faintly under fluffy-dried hair. He turned wordlessly and followed Ryouma back into the storm. Something was seriously wrong. Kurenai pressed her lips thin. If Genma wouldn’t speak to her yet, it was something they couldn’t risk in Team Nineteen’s presence. Something Ryouma had been desperate to tell his officers, before Nineteen arrived. Surely this was extrapolating too far. No opinion. No judgment. An Intel agent’s cardinal sin was to analyze before gathering sufficient data. Even if it did explain what had gone so badly wrong with Rin, three years ago. Several assorted kits produced ration bars, freeze-dried eggplant and miso soup, and vegetable and chicken curry. Sumeragi, Hakone, and Aburame Mayumi reappeared, wearing voluminous rain cloaks over dry clothes. They’d set their own tents further up the hill and reinforced the slope against mudslides. That led to an argument over the worst mudslides Team Nineteen had experienced or heard of on missions. Raidou glanced at Genma and steered the conversation into mission stories generally — which quickly descended into mission bragging. Team Nineteen had completed seven missions with a 100 percent success rate and no injuries requiring hospitalization. “Eight if we count tracking down you,” Ushiro said smugly. Genma and Raidou shared a speaking glance, and refused to give statistics on their own hospitalization rate. Kakashi returned with four rabbits and a faint smell of ozone. Ryouma dragged back under the tarp shortly after, muddy to the knees, to report he’d set up tents and dug a latrine pit. Only Ushiro pointed out that it looked like he’d also fallen in. The rain slackened. Downpour became drizzle, and then merely steam rising from wet vegetation and overheated bodies. A few venturesome mosquitos buzzed. Ryouma pulled his shirt back on. “We established a perimeter when the rain stopped,” Mayumi assured him. Mayumi gave Ryouma a friendly little wave. A bug crawled out of her sleeve. He swallowed, waved two fingers back, and scrambled up gratefully as his officers moved. Kurenai left Nineteen to sort out their watch schedule and followed Team Six toward their tents. The rookies walked shoulder-to-shoulder, but that wasn’t new. Ryouma dropped his chin, exhaled, and crouched to crawl into his tent. Kakashi flicked a cool, silent look at Raidou, and followed. No judgment in advance of facts. Raidou gestured toward the officers’ larger tent: after you. Kurenai kicked off her sandals, opened the flap, and ducked inside. It was dark and close, with bedrolls piled against one wall and a set of intact glowsticks hanging overhead. Kurenai reached up and snapped them, illuminating the tent with a soft yellow glow. Then she folded down cross-legged against the bedrolls, set her hands into the seals of her silencing jutsu, and waited. The ANBU stripped off their armor and sat down across from her, not quite at the points of an equilateral triangle. Closer to each other, as if she sat on the other side of a desk, waiting for their reports. She couldn’t shake the feeling she should have been holding a clipboard. She didn’t like it. That— was not what she’d expected. “It would have been the only opportunity. She never left her mother’s sight, afterwards.” Kurenai frowned, thinking back. “She talked to Tousaki while we were washing up at the river that night, but only a few words.” And that was after Kurenai and the officers had returned from their visit to Tanigawa. So, had Tousaki and Kakashi acted on a moment of reckless impulse, or had they spent those long hours of morning-turned-evening plotting murder? Tousaki hadn’t struck her as much of a plotter. Kurenai tapped her fingers on her thigh. Before the tanuki sake, or afterward…? Memory plucked up plenty of corroborating instances, now that she was looking for them: Tousaki’s faulty attempt to defend Kakashi from Satomi’s grudge in Water Country’s lava caves; Kakashi’s possessiveness that night at Embers; the rookies’ moonlit stroll around the tanuki pond. At what point did reluctance to reason in advance of facts become willful blindness? On the other hand, she’d already witnessed Team Six’s tendency to magnify team loyalty into suicidal devotion, mission be damned. And none of them had had the excuse of sleeping with Genma to justify it. It brought something else to mind, though. Raidou tipped his head towards Kurenai, inviting her opinion. The clone slipped out of their tent and stalked off with rigid shoulders. Moments later, Raidou felt it exit the world, leaving a fleeting memory of Ryouma’s alarmed face and Kakashi’s resigned sigh behind. “Yuuhi has questions for you,” Raidou said. Kakashi eased reluctantly inside, and slouched his way into a crouch. He eyed Kurenai with the wiped-clean expression Raidou had started to interpret as wary. Kakashi nodded, as if that answered his question, and launched into a monotone account that, as far as Raidou could tell, spared most of the details. Sen had approached them. Kakashi had agreed. Ryouma, in this version, had only been involved to the extent that he’d happened to be standing there. The air in the tent went a little icy. Before Raidou could threaten to throttle him — or make good on his previous threat to throttle him — Kakashi took a shallow breath, broke eye contact, and fixed his glare on a tent pole. More slowly, with occasional back tracks and self-corrections, he laid out a story that felt real. Sen approaching Pakkun, of all goddamn people, to ask if his idle comment had been true. Half a ryou, and we’ll take an IOU. Ryouma questioning her: Fire Country isn’t far enough? And Sen’s answer, which made Raidou’s heart hurt. He knows people. He’ll find us and kill us. The plan, to make it look like a suicide. The agreement, written on a scrap of paper, signed with Kakashi and Ryouma’s actual signatures, and a code word for Sen. The promise to bring back proof of death. And at the end, Pakkun escorting the girl away for breakfast. “Why didn’t you just tell us?” Raidou demanded, before Kurenai could probe more delicately. Raidou ground the heel of his palm into one eyesocket, and got it. One damaged kid appealing to two others, with their three combined histories of blood and bad parenting. Ryouma’s kneejerk instinct to protect, Kakashi’s cold talent for the quickest strike. It was no excuse, but he could see the thread. “Taichou,” Kakashi said tightly. He left the tent with stiff shoulders. In the brief interval before Ryouma arrived, Genma braced his head in his hands and vented a frustrated sigh. “Remember when this was supposed to be an easy mission?” Raidou asked no one in particular. Genma gave a hollow little laugh. “Apparently weird wasn’t enough,” Kurenai said. The way Ryouma’s voice faded to a near whisper, and the kicked-dog look in his eye, was probably a reflection of exactly why he’d identified with Sen so much. He’d screwed up, he knew he’d screwed up, and now he was expecting unbearable punishment. Genma’s head hurt. How could he respond in a professional way, when he was angry and disappointed, and at the same time found himself feeling sorry for Ryouma? Kurenai tapped her fingers against her knees; Raidou had a thoughtful look in his eyes. Neither spoke. There was the crux of it. The difference between an assassination and a murder was intent, and Ryouma’s intent had been murderous. There was no way around that. But that wasn’t all of it, either. Everything they’d surmised in talking with Kurenai was true, then. The alcoholic and abusive grandfather. The way Ryouma saw himself in Sen, like a soldier having war flashbacks on a mission. Speaking the words aloud had been a heavy price. Ryouma’s shoulders sagged. Sweat ran down the side of his face. You’re his officers, Kurenai had said. Will you pull him off the mission? They should have, and they hadn’t. And now it was too late. Although what could they have done to pull him once they were in the field? Send him back to Konoha alone? That was how missing-nin were made. And suicides. Reluctantly, Ryouma raised his head and met Raidou’s gaze. Kurenai’s crimson eyes were hooded and watchful, intent on Ryouma. Ryouma wet his lips. “Yes. He needed to die. But I should have done it differently.” Guilt edged the fierceness out of his voice. They were still on dangerous ground — that answer still much closer to ‘murder’ than ‘mission’ — but it sounded honest. The real question wasn’t what should you have done, though, it was what happens next time. “If you were in a situation like this again, what would you do?” Genma asked. “I should tell you.” Ryouma’s voice came thick and reluctant, halting around each word like a stumbling block. Genma looked up at Raidou, hoping he’d caught the same meaning. Now what? Rookies closing ranks around each other? Raidou was right, what this team lacked was a veteran. Someone to be the go-between with the officers and the rookies. ANBU was different from regular service; team hierarchy and unity was more important than individual action. With Katsuko gone, the only person left to fill that role was Genma. Ryouma looked away. He said roughly, “I will. Next time I’ll tell you.” His posture wasn’t any less tense, as if Genma hadn’t spoken at all. Kurenai was watching and might report all of them for the failings piled on failings of this successful mission. 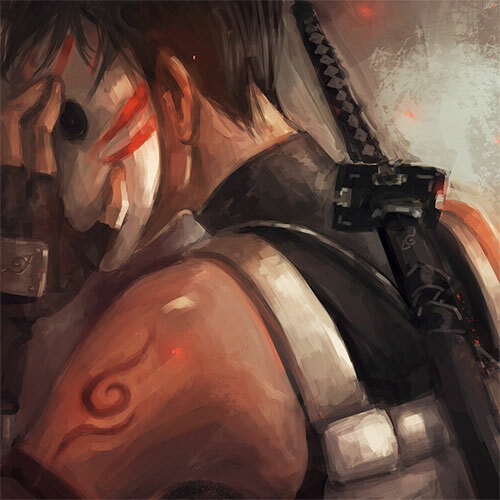 Maybe she was right, and Ryouma was too emotionally unsteady for ANBU. Maybe they should have furloughed Ryouma as soon as he’d shown those first fractures, on the Tsuto mission. But they were here, now. Ryouma shivered once, and his eyes refocused on Genma. “An uneventful trip home,” Raidou said. One corner of his mouth tilted up slightly. I’m not mad anymore, but for all that’s holy can we please have no more surprises? “Go get some sleep,” Genma added. Ryouma ducked his head in a swift bow, and left them. “How do you mean?” Genma asked. “Given that our mission involved mythical wolf and tanuki gods, and interdimensional travel, I expect one hundred percent of our mission reports will be for higher, more exclusive channels only, don’t you?” Genma said. “That’s not going to make them curious,” Raidou said, but he nodded agreement. “Thank you,” Genma told her. She gave him a brief smile and brushed her hand over his shoulder and through his hair as she passed. He reached up to let his own fingers brushing hers, and then she was gone. For the first time that Genma could remember, Raidou copied the gesture and said fervently, “I’d rather deal with a thousand bad rookie decisions.” His voice drifted more thoughtful. “If Yuuhi’s aware of something, then her superiors are, too. Oita-sama is loyal to Yondaime-sensei, so they must be keeping tabs on things.” He tipped his head back and sighed out a shiver of tension. “Nishi-sensei was colorful.” Genma shrugged. “Hey!” Raidou said, feigning offense. “I’m good for it.” He kicked back, and laughed when Genma didn’t dodge. “It’s a da— deal,” Raidou said, catching himself halfway through the word. Maybe someday, when they weren’t juggling insubordination, psychologically scarred rookies, mythical monsters, and ethical boundaries, it would even be a date. —it still felt worth it. Besides, he’d taken more lives for less, at Konoha’s request. Konoha could credit him this one. The tent flap pulled back. Kakashi spun around. Ryouma ducked out, stone-faced, swept a blind look over the clearing, and stalked off — not towards their tent, but towards the forest. He didn’t seem to notice Kakashi. Kakashi thought of a handful of vicious swear words, and went after him. Ryouma cut a straight line through the dripping undergrowth. He strode through pines and thorns and ferns with sharp-edged leaves, until he reached an ancient tree that, as far as Kakashi could tell, was no different from its neighboring trees, and punched it. Yes. That was the important concern. There was a fallen tree next to Ryouma’s chosen target, slewed at a steep angle. Kakashi hitched himself up onto the trunk and sat, because the set of Ryouma’s shoulders made him think of a bear trap, ready to bite off an unwary hand. Don’t touch. Not yet, at least. “I’m comfortable here,” he said. Ryouma’s head jerked back, like a horse hitting a wall mid-run. Right now, Kakashi was inclined to tell the officers to stick their collective heads in a bucket, along with Kurenai. Especially if they’d said Ryouma was no good for Team Six. But a cooler thought prevailed. So — they hadn’t said Ryouma didn’t belong on the team? A knot of tension unwound below Kakashi’s ribcage. “I know,” Kakashi said, because he did. Ryouma had had them on this mission, twisting himself up in blankets and misery, keeping Kakashi awake, until Kakashi had tucked up against his ribs. That wasn’t a cure — neither was Nomiya’s death — but it had won a reprieve, at least for one night. Kakashi reached up and touched his fingertips to Ryouma’s face, where cheekbone and jaw-hinge met like a fist of tension. Ryouma watched him, eyes tired and wary. Following was easier than fighting. Kakashi was right about that. It didn’t sound good when he said it — Ryouma would’ve fought back if the officers were wrong, maybe — but each step in Kakashi’s wake settled something deep-buried. The iron bands around his lungs loosened. He drew one deep steadying breath, and then another. Wet ferns slapped at his shins. Overhanging trees dripped down his neck. Kakashi’s fingers curled warm and protective around his, and slowly Ryouma began to feel the sting of his split knuckles, and the chill of the midnight mountain breeze. “It’d give him something to focus on besides yelling at us,” Kakashi said. Maybe they should’ve guessed. Maybe Raidou should’ve told them. Ryouma caught himself on the brink of that maelstrom of maybes. He clung a little tighter to Kakashi’s hand. “If they decide to just punish us themselves… Running to all the way to Sumoto and a stack of the lieutenant’s paperwork still seems worth it,” Kakashi decided. “Like you wouldn’t go out of your mind with stir-crazy,” Ryouma muttered. “Taichou’s suspension was bad enough.” Although they’d had those three weeks for surgery, recovery, study; flashcards and anatomy charts, shared meals in Ryouma’s room, jutsu theory, even jokes. They still had work to do, refining Kakashi’s stolen blood-blade jutsu. Kakashi ducked his head. Wet hair and darkness hid the last unmasked slice of his face. His shoulder rounded with tension, but he didn’t drop Ryouma’s hand. “Thank me in the tent,” he murmured, and pulled Ryouma on again. It was a tent. Ryouma didn’t think he could keep that quiet, not unless he learned Kurenai’s silencing jutsu. He followed Kakashi anyway. They dropped hands under the shadow of the last trees, before the damp little clearing of camp. Team Nineteen’s massive veteran, Nakamura, paced a watchful circuit on the far side of the tent where Harubi’s family slept. Sumeragi, the captain, crouched beneath the tarp next to the banked fire. Kurenai sat cross-legged beside to her. Ryouma faltered. Kakashi ignored them both. He crossed to their small tent, shed his boots, unzipped the flap, and crawled inside. Ryouma ducked a wary glance back at the fire. Kurenai lifted a steaming mug and sipped. Sumeragi said something. Kurenai’s eyes met Ryouma’s, over her mug. Her face did not change. She lowered the mug, turned to Sumeragi, and responded. Ryouma unlaced his boots and ducked into the tent as quickly as he could, before she changed her mind. Inside was dark and airless, the coated canvas roof brushing his hair. Kakashi was a shadow bent over black lumps of gear, until a lightstick cracked and glowed eerie blue-green. Kakashi’s grey hair turned turquoise at the edges. His eye looked almost black. Kakashi hooked the lightstick into the strap dangling from the low ceiling. He twisted through a few familiar seals and stripped the water from their clothes and hair, sending it spinning out in a narrow ribbon through the open tent flap. The clotted blood over Ryouma’s knuckles cracked and pulled. He lost the rest in a startled squawk, as Kakashi caught his collar and tugged. A seam protested in his shirt. Ryouma let himself topple before the fabric ripped entirely. His head hit Kakashi’s thigh, and the grip in his collar shifted to hold him down. Dazed, Ryouma lifted his split knuckles. Sterile packaging ripped. An antiseptic swab stung the raw flesh. This was probably actually happening. He was lying half-curled, on his side in a narrow two-man tent, with his head in Kakashi’s lap, with Kakashi cleaning Ryouma’s own stupidity-induced wound. It didn’t seem like the sort of thing he’d imagine, even after that night by the tanuki pond. Why is your life worth less? Maybe it wasn’t just his life Kakashi worried about. Another antiseptic swab, tweezers to remove a splinter he’d barely noticed, antibiotic cream, a swath of bandaging from first joint to wrist. Kakashi tied the last neat knot and lowered Ryouma’s hand to the blankets. Foil and paper crinkled above him. A plastic snap closed. Then Kakashi’s hand curved over Ryouma’s head, fingers sliding into his hair. Carefully, intently, he carded Ryouma’s hair back over his ear, returned to his temple, repeated. It was the same precise focus that shaped his jutsu, every movement meant. The edge of his palm dragged over Ryouma’s cheek and cupped his ear. “It’s going to be okay,” he said, and the gentleness softened his voice, too. Ryouma closed his eyes, and remembered Genma saying almost the same thing. We can all do better. We’re not letting you go. He’d heard it in the officers’ tent. He’d even tried to listen. But the panic had swept up too fast and too black and dragged him under, closing over his head before he could breathe steady again. The panic seized on half the words, the ones that said can’t trust you and can’t take you and not letting you off, and drowned out the ones that said you’re part of this team. In the still of this tent, with Kakashi’s hand in his hair, with his own pulse beating in his ear against Kakashi’s thigh, he could hear the words that mattered more. “I’ll do better,” he whispered. Ripples spread where the words fell, like stones in a quiet pond. Kakashi’s face looked new-made from this unfamiliar angle; the shadowed underside of his jaw, the mask pulling tight and then loosening over his nostrils as he breathed, the grey eye unguarded by its heavy lid. Surprised, maybe. The fringe of Kakashi’s lashes swept down, up again, in a slow bewildered blink. His skin darkened over the edge of the mask, faintly purple in the blue-shaded light. After a long moment his hand resumed its stroking path through Ryouma’s hair. It lifted and returned and fell again, before finally trailing down to settle around the back of Ryouma’s neck. His thumb rubbed through the short hairs and down to bare skin there, following the path of a tense muscle. He should. Jounin fought on their own, or commanded squads. They shouldn’t need someone to shield them. But teams were structured so they could watch each others’ backs. If Ryouma were deadweight, he’d never have gotten this far. It was the terror of knowing that someday he might: that with someone to lean on, he might let himself go. That if he trusted Kakashi to stop him, he’d give up trying to stop himself. Except— With Kakashi watching, how could he dare give less than everything? Kakashi’s eye creased into a smile. “Good.” He shifted his hand to support Ryouma’s head and then eased his leg out from beneath. Blinking, Ryouma tried to push up. A pointed nudge got him to roll instead, settling properly lengthwise along Kakashi’s bedroll. Kakashi stretched out behind him on Ryouma’s own blankets, pressing up against Ryouma’s back. His chin hooked over Ryouma’s shoulder, and his arm wrapped snugly around Ryouma’s ribs. His fingers continued their slow flex-and-curl against Ryouma’s belly. Ryouma closed his eyes. He felt for Kakashi’s arm, and found it. The stroking didn’t still. Ryouma wrapped his hand below the sharp ridge of the wristbone, breathed in warmth and comfort, and finally breathed out fear. Dear writer : I just love you with feelings ! They are so sweet all of them and Kurenai is angsty : what’s goin to ? It’s true that all thing like the trials, the aborted coup had no real response… So what’s going on ? Are they going to be good ? Kakashi and Ryuma are cute. And Genma and Raidou… a da… a deal ? Yes ! Thank you for this thread !